Improved engine performance, fuel savings and increased safety are just a few of the benefits that have come with technological integration of our vehicles. Perkins is driving that technology down to is fuel injectors. New and remanufactured injectors now are outfitted with E-Trim codes. These unique codes normalize the work of injectors by reducing variability, which optimizes engine performance. Shaped like a miniature nozzle, the fuel injector might be small, but it’s importance to an engine is huge. Its job is to deliver the correct amount of diesel fuel into the piston at precisely the right time so that combustion can occur. Too much or too little fuel at the wrong time and trouble ensues. 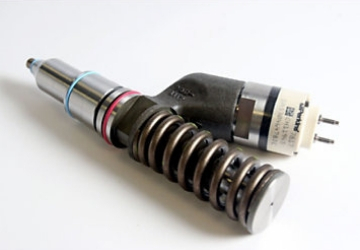 A faulty injector can cause numerous problems, including clogging spark plugs or degrading oil. The overall result is a dramatic decrease in an engine’s efficiency. In a worst-case scenario, a faulty injector can ultimately damage the heart of a machine. An E-Trim code ensures that an injector is accurately delivering fuel to the piston. This enhanced monitoring ensures the proper pressure is maintained within the piston. It also keeps the piston in balance, maintains the correct emission standards and maximizes fuel consumption. All E-Trim codes and files are contained on a CD that comes inside the injector packaging. The engine operator will appreciate the use of E-Trim codes because it helps keep engine noise to a minimum and reduces the risk of vibration or harshness in how the engine runs. Perkins backs all new and remanufactured injectors fitted with E-Trim codes with a 12-month parts warranty to give you peace of mind. Let us or any of our factory-trained technicians in our trusted dealer network improve your engine’s performance by retrofitting your power plant with genuine Perkins injectors outfitted with E-Trim codes.